The Leigh Sakoda Foundation is a California-based memorial fund in honor of Leigh Ashley Sakoda, who died at age 34 from a rare and aggressive cancer. The foundation aims to inspire research, improve diagnostics and provide treatment options for young women facing rare cancers. Since 2010, the Leigh Sakoda Foundation has helped support more than 50 families struggling with the financial burden of cancer. Read Kezia’s powerful story below and learn how the Leigh Sakoda Foundation’s grant assisted with her mortgage payment, auto bills and acupuncture treatment and helped her family focus on healing. 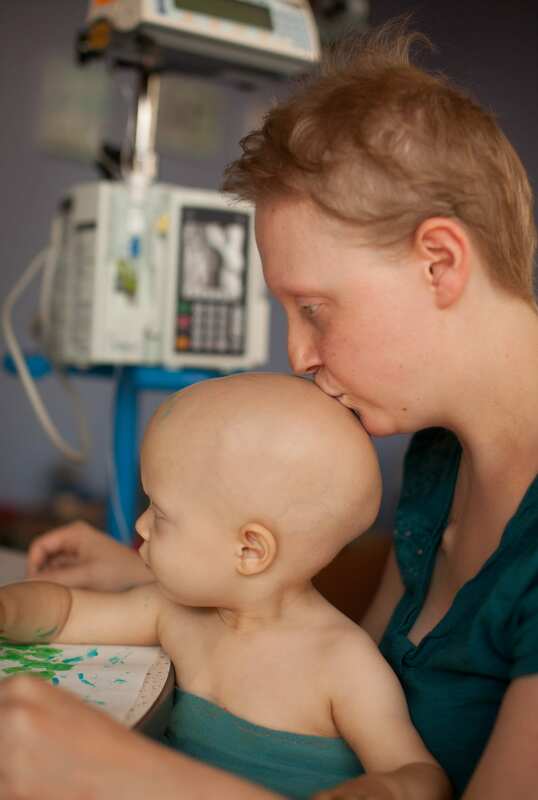 Kezia and Saoirse in 2011, when they were both undergoing chemotherapy. By most standards I led a pretty typical, mundane, ordinary American life. I was born to loving parents and raised in a suburban Massachusetts town with good schools. I went to college right after high school, where I studied photography and met my now husband, Mike. We got engaged shortly after I graduated, moved from Chicago back to Massachusetts and got married. A year later we bought a house and soon found out I was pregnant with our first child. In the midst of starting our family, I began experiencing strange symptoms. We didn’t know it at the time, but this is where our cancer journey begins. I had very swollen lymph nodes in my neck during pregnancy. My doctors chalked it up to the congestion I’d been having, saying it would go away after the baby was born. I was feeling great otherwise, so I didn’t worry about it. When our little girl, Saoirse, was born I lost the baby weight quickly and was very tired. Everything seemed connected to being a new mom, except the swollen nodes that persisted. My husband urged me to get additional tests, so I went back to the doctors and was referred to a surgeon. He did a CT scan and then never called, so I followed the old adage, “No news is good news,” and kind of forgot about it. A few months later, I got a call from his office. They had switched their system and somehow my follow up got lost in the mix. They wanted me to come in immediately to review my scan. Turns out, I needed a biopsy. Concerned with this office’s performance, I asked to be referred to a different surgeon. I was nervous – I hated hospitals, and hated needles even more. Fortunately, I was comfortable with the new doctor and my biopsy was swiftly performed. The answer came quickly. At 26 years old, I had Hodgkin’s Lymphoma. Apparently, the doctor told me the news while I was waking up from anesthesia, but I don’t remember. Mike had to break the news to me on the way home from the hospital. I was numb. That day I started blogging about my journey, with the intention of just Mike and I reading it. It allowed me to communicate my feelings to him when I didn’t want to talk. I met with an oncologist who discussed the additional tests I would need and what chemo I would likely start. I desperately wanted to find somewhere to do alternative therapies, but my family and I were scared and the chemo had a 75 percent chance of curing me – despite my stage 3b diagnosis. I started a clinical trial with a lower toxicity regimen, designed to preserve fertility in young patients, and was off and running. The first dose was rough, so a port was placed for the second. This helped ease the process, but the side effects still started to take a toll. We got into a routine and after four doses of chemo my scans proved I was clear. We were cautiously optimistic. I still had four months of treatment ahead of me, but I was glad that everything was working. While in the midst of my chemo, Saoirse developed strange symptoms. She had always had a big belly and at six months the doctors officially diagnosed her with a belly button hernia. They told me it would close on its own by the time she was six. A few months later, she had an inguinal hernia pop out. As she screamed in pain, we rushed her to the ER where she was referred to a surgeon to repair both hernias. By 10 months old she was in bad shape. She woke up one night screaming and laying stiff in her crib. Mike calmed her and got her back to sleep. The next day she had two black eyes – she looked like she had been in a schoolyard brawl. We took her back to the ER. They said she must have allergies, causing her to rub her eyes. We knew better. Saoirse still wasn’t acting like herself and my mom noticed that her face looked different. She had bumps on her head and she was constantly uncomfortable. After weeks of being in and out of all kinds of offices, another pediatrician in the practice saw Saoirse. She was quite concerned and ordered some blood work. A few hours later, she called and said that Saoirse needed to have a CT scan ASAP. While we waited, a resident came in and asked if there was anything we could think of that might not have been looked at. I mentioned that Saoirse had had the hernia surgery and asked if she could be bleeding internally from that. This was the first time anyone pushed on her belly. After being asked when the last time she had a bowel movement was (earlier that day), the doctor ordered an abdominal ultrasound. With the scan and ultrasound done, we waited. Four doctors walked into the room and told us words we never thought we’d hear – your daughter has cancer. We were shocked and numb. An oncologist came in and saw us. We signed consent forms to start chemo just 24 hours later. We didn’t have to read them. They were for the same drugs I was already taking – we knew what they said. We were moved upstairs to the oncology floor, where we stayed for a week. It was all a blur – tests, scans, blood draws, pain meds, chemo – but Saoirse started to feel better and act more like herself. We were getting our baby back. We began a new normal. Schedules were coordinated, medications managed and help lined up. With two of us going through treatment, Mike took a leave from work, leaving us with no income. We weren’t sure how we would make it work, but our family, friends and community provided tremendous support and helped us keep up with treatment and living expenses. For the time, we were ok. I finished my chemo in July 2011. Saoirse was still in the middle of hers, but she was doing well. That September, she had surgery to remove her tumor. A few weeks later we found out she was NED – no evidence of disease – and we began a less toxic maintenance therapy at a new hospital. Devastatingly, further testing at this institution showed that the cancer was back in her bone marrow. We returned to Boston, but none of the new chemos worked and radiation only held back some of the disease. Saoirse continued to go downhill and on December 13, 2011, she died from neuroblastoma. She was 18 months old. We were distraught and lost. We moved forward because we couldn’t move backward. We started a company to produce medical products that I had developed for Saoirse while she was in treatment. We also decided we wanted to be parents again. Less than a year later, we found out I was pregnant. I was terrified, but everything looked ok.
Our son Lochlan was born in 2013. When he was about six months old, I woke up in extreme pain and went to the ER. They suspected kidney stones and ordered a CT. Not only did it confirm I had stones, it showed swollen lymph nodes in my abdomen. After more tests and another biopsy, it was confirmed – now 29, I had relapsed. Shocked and angry, I refused to go into conventional therapy right away and began several alternative therapies. I felt good. I was confident. I was in control. This time would be different. I focused on work and Lochlan. We traveled and I felt like I was getting to experience life this time around. I didn’t feel like a sick person. I was sure that I was right, but this time turned out to be similar to the last. Only now, we had no savings left. Our family and friends helped when they could, but even they hadn’t recovered from the last round. We were scared, and we started to see that this was going to be a long haul. It’s hard to find support when opting for alternative therapies. Even family and friends were reluctant to help out when they knew I wasn’t going for conventional treatment. Searching for financial support from private and public foundations, I stumbled upon Family Reach. I decided to connect and see if they could help us with some of our bills. Regardless of my decision to use alternative therapies, they were willing to provide us with financial support to help keep us afloat during treatment. I was thrilled to have found people willing to put their money where their mouth was. It allowed me to remain hopeful and focus on healing. For two years, my disease was relatively stable. Things took a turn for the worse at the beginning of 2016. By June, I was very sick and knew it was time to reach into the conventional therapy toolbox. I began chemo, but it proved ineffective. I made my next intervention choice – a recently approved immunotherapy that showed great promise and allowed me to remain at my home hospital with my beloved nurses. The results have been encouraging and while my journey isn’t over, I am closer to remission than I have been in years. Family Reach provided the support I needed to keep myself going through treatment and focus on my quality of life. The time that I have been given is irreplaceable, and for that I am truly grateful.